This article is a modified version of one originally published on DPNow.com. Five years ago I produced a short article aimed at helping people take better pictures at fireworks displays.That article is certainly worth a look, even today. Here, you're reading an update on that article, and it's especially topical here in the UK because we're on the eve of a week of fireworks displays that celebrate the failed 5th November 1605 attempt to blow up the Houses of Parliament in London; the so-called Gunpowder Plot. This time I have produced a gallery of 28 pictures, with notes and camera data to help you get a feel for ideal settings when photographing fireworks (see clickable thumbnails further down the page). Most of the example images were taken using Olympus E-System cameras. Unless you are using a special fireworks scene mode in your camera,or you can't switch auto mode off, I'd suggest abandoning auto exposure modes altogether. Instead, use the lowest ISO setting your camera can muster, set the shutter speed between 1 and 5 seconds, and take as many shots as you can. Fixing the camera so that it doesn't move during these long exposures is not essential, but I'd advise it, so your tripod might get an outing. Do be careful about where you set a tripod up as there is a real danger that other spectators could trip over one of the legs. If you are not using a tripod, and if you camera features image stabilisation, it's well worth turning this feature on. Experiment with the aperture setting, with f/8 a good starting point. 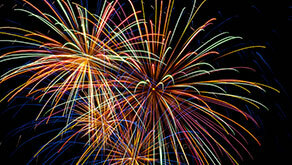 Avoid over-exposure as this will bleach out the vivid colours of the firework trails. It's easier to fix a fireworks picture that is a bit too dark than one which is too bright. Focus is very important. Once again, forget about autofocus if you can. Try to work out the hyperfocal distance setting for your lens. This is the nearest focus distance that maintains sharp focus to infinity. You can work this out in the day time and remember the settings for different lens focal lengths and apertures. Remember that the smaller the aperture setting, and the shorter the focal length, the closer you can focus your lens and still guarantee the distant fireworks will be in focus. In many cases, tweaking your fireworks shots in post-processing can reap very handy dividends. Tricks include increasing colour saturation, increasing contrast to suppress the glow of distracting smoke, boosting black levels, and (of course) cropping to improve the composition. Another tip is to not miss out on shots away from the fireworks. Such events often offer interesting alternative subjects, like bonfires, your friends and other attractions. It's worth bringing a flash gun for fill-in flash, just in case a suitable scene appears. Here are the example pictures, complete with notes, that could help you get an idea for good camera settings and composition. Above all enjoy the display, and share some of your pictures with us on the DPNow photo gallery, discussion forum, and blogs!